1965 - All-Union Art Exhibition. Moscow. 1965 - Graduate's Exhibition of the USSR Art Colleges. Moscow. 1967 - The First Moscow Exhibition of Young Artists. Moscow. 1968 - "Fifty Years of the USSR". The All-Union Exhibition. Moscow. 1969 - "50 Years of Young Communists League". The All-Union Exhibition. Moscow. 1973 - Group Exhibition of the Russian Federation Artists' Union. Moscow. 1975 - All-Union Exhibition of Graphic Arts. Moscow. 1976 - Spring Exhibition of Moscow Artists. Moscow. 1979 - All-Union Exhibition of Posters. Moscow. 1980 - "Olympics '80". The International Exhibition of Posters. Moscow. 1983 - All-Union Exhibition of Books and Posters. Moscow. 1987 - Group Exhibition of the USSR Artists' Union. Moscow. 1991 - Regional Exhibition of the Russian Federation Artists' Union. Moscow. 1991 - Solo Exhibition. The House of Zionist Confederation. Jerusalem. 1992 - Group Exhibition. Ein-Karem. Jerusalem. 1992 - Solo Exhibition. YMCA. Jerusalem. 1992 - Exhibition of New Members of Jerusalem Artists' Union. Jerusalem. 1992 - Exhibition of New Immigrants. Tel Aviv. 1992 - Solo Exhibition. The House of Zionist Federation. Jerusalem. 1993 - Group Exhibition. Discount Bank. Jerusalem. 1993 - Group Exhibition. Leumi Bank. Tel Aviv. 1994 - Solo Exhibition. YMCA. Jerusalem. 1995 - Solo Exhibition. Chabustan Gallery. Jerusalem. 1999 - "The Turn of the Millennium". Group Exhibition. Jerusalem. 1999 - Autumn Exhibition of Jerusalem Artists. Jerusalem. 2000 - "The Turn of the Millennium". Group Exhibition. Jerusalem. 2003 - "St. Petersburg: 300 Years Jubilee". Group Exhibition. Haifa. 2003 - "The Golden Brush". 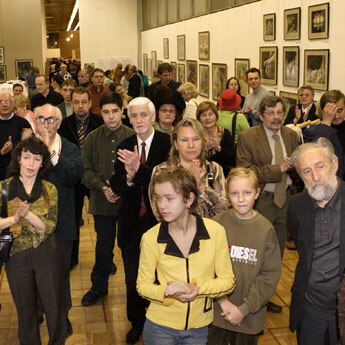 Group Exhibition of Self-Portraits. Pardess Hanna. 2005 - "Apocalypse. Reality and Masks". Central Artist's House, Moscow. 2013 - "Reflected Spaces". Skizza gallery. Group Exhibition. Jerusalem. 2014 - "Still lifes and Dances". Jerusalem Russian Library. Jerusalem. 2014 - "Mixed Media". Skizza gallery. Group Exhibition. Jerusalem. 2014 - "Selfportrait". Skizza gallery. Group Exhibition. Jerusalem. 2014 - "Artentsiklopediya". Israel's Artists of Post-Soviet Space. Harmony Art House. Jerusalem. 2016 - "Bestiary". Skizza gallery. Group Exhibition. Jerusalem. 2016 - "The Space of Memory". Skizza gallery. Group Exhibition. Jerusalem. 2016 - "The New Only". Skizza gallery. Group Exhibition. Jerusalem. 2016 - "The Family". Skizza gallery. Group Exhibition. Jerusalem. 2016 - "Text, Letter, Calligraphy", Skizza gallery. Group Exhibition. Jerusalem. 2017 - "Fantasy", Skizza gallery. Group Exhibition. Jerusalem. 2017- "Cosmoport. Jerusalem-2". Skizza gallery. Group Exhibition. Jerusalem.